The Coppertones played at our wedding in April 2007. Not only are they a great shag band, they were so easy and fun to work with. They made sure our guests had a great time - in fact, friends are still commenting on what a fantastic job the band did. 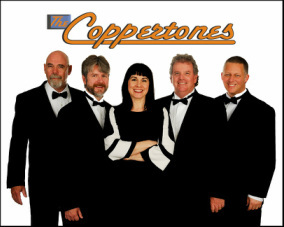 We 110% recommend The Coppertones!!! "Charleston, SC"
"I wanted to thank you again for a wonderful job by The Coppertones at our reception. You all made our event a success and we couldn't be more pleased. We have received numerous compliments from our guests and everyone we've talked with since the wedding has agreed that the music was fantastic. The atmosphere you created was exactly what we had envisioned - with little direction from me or the wedding director. In spite of our shortcomings in communicating with you, the group handled everything very well. Thanks again and we will certainly recommend you in the future - we have lots of friends and classmates in Charleston who are engaged or who will be soon, and we'll try our best to send them your way. "Asheville, NC"